See the back of the gray opossum and a size comparison with a soda can. 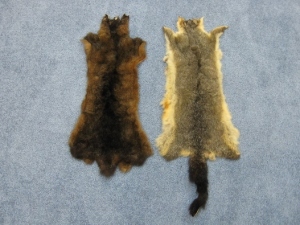 The Australian Opossum skins are available in limited quantities. 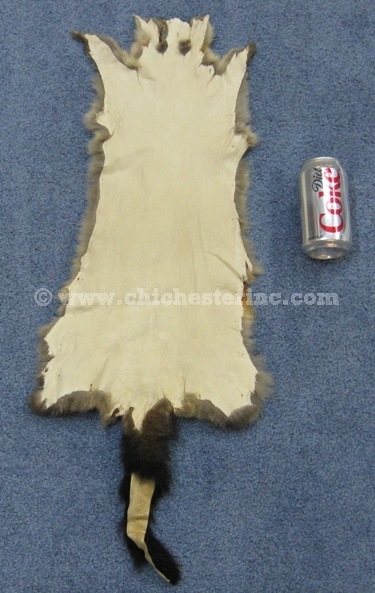 They are fully furred and may tails, but do not have feet.The trading post quality are #1 and #2 skins from New Zealand. We also have a limited number of skins with thinner hair than fashion quality skins. The Australian Opossum have a softer, fuzzier hair than the North American Opossum. Sizes will slightly vary. We measured one skin to be 19" long, not including the tail, the trunk of the body as 18" long, the width 9.5" and the tail 6" long. It weighed 2.4 oz. Genus and Species is Trichosurus vulpecula. Wild.